There's a very powerful insight embedded in the Strong Towns analysis of urban form and development. This is that economically productive places need not be the places where wealthy people live. Yet the public and elected officials too often fail to understand this—and as a result, many local policy efforts to generate wealth range from ineffectual to outright counterproductive. This is because we don't understand what creates lasting prosperity in a community, and focus instead on producing and maintaining a visible illusion of wealth to make ourselves feel good about the future. Let's distinguish between two kinds of wealth that may exist in a community: one more transient and mobile, the other fundamentally rooted in the physical place. The first kind is able to flee at a moment's notice when a better opportunity comes along to invest it somewhere else. Residents with high personal incomes and a lot of freedom to choose where they want to live fall into this category. They can leave as easily as they arrived. When the infrastructure starts to crumble and the money isn't there to repair it, when property taxes begin to skyrocket while the public schools decline in quality, when it's 2016 and the houses that boasted every modern convenience and attractive design when built in 1986 now feel dated, these people are gone. America is littered with suburbs that were their respective metro areas' elite bedroom communities a generation ago and are now experiencing increasing poverty and a shrinking tax base as the title of "next best place" leapfrogs somewhere else. Call it the Ferguson Effect if you want. Wealth in communities with a single-industry economy or very small number of dominant employers, especially one driven by a nonrenewable natural resource, is similarly fragile. When the boom times are over, they're over. This is in large part the story of Scranton, Pennsylvania, where I spent Christmas this year visiting family. Real places are always more complex than the caricatures of them that become fixed in the popular imagination (What, you mean not everyone in Portland, Oregon is a fixie-riding underemployed vegan?) and yet the caricatures are rooted in truth. Scranton has a fairly low median income and a couple years ago its metro area had the highest unemployment rate in Pennsylvania. The place is somewhat gritty. There are many vacant buildings and infrastructure in disrepair. And yet I find cities like Scranton fascinating places from a Strong Towns perspective. This is because I think Scranton, for all the decline it has suffered, has more than its immediately-apparent share of the other kind of local wealth (remember I said there were two kinds?). This is the kind that is fundamentally "built in" to a place and can't pack up and leave town when times get rough. The kind that comprises a productive place. The Northeast is dotted with mid-size cities like Scranton that have pre-automobile "bones" because of their age. As a Midwesterner, I always find it a pleasant novelty to visit such places. The city of Scranton and its suburbs (a continuous strip of development dozens of miles long filling the narrow valley of the Lackawanna River) are dotted with little neighborhood commercial hubs that look like the above photo. These hubs all exhibit a traditional development pattern that is tried and true and almost invariably highly productive. Commercial uses on the first floor, residential above. The original proprietors most likely lived above their own shops. Small storefronts create a pleasant and varied streetscape for pedestrians. Narrow streets mean a high intensity of income-generating land uses relative to the amount of public infrastructure required to service them. This development pattern is also resilient to economic boom-and-bust cycles because of its adaptability. A place like this is built to change. Take the one block shown in the Google Street View image above (an intersection known locally as Dunmore Corners - a colloquial name like that for a cluster of independent shops is evidence of a successful place). There are two banks, men's and women's formal wear stores, law offices, an insurance agent, an optometrist, adults' and children's clothing stores, a candy store, two Italian restaurants and a deli, a bar, a diner, a salon, and the list goes on. And if one closes for any reason—because it can't make ends meet, because the owner retires, or because changing demographics, culture, or technology reduce demand for the service it provides—something else can quickly fill that space. When a big-box store closes, you're stuck with a big, expensive box that is hard to retrofit. The results of such adaptation are chaotic but smart. They're improvisational responses to local needs and market conditions. Rigid zoning codes are rarely up to the task of guiding and promoting the best such responses: the best they can do is stay out of the way. One of the best things we could do to move toward a nation of strong towns, thus, doesn't even require policy makers to do more. It requires them to do less. We should be categorically allowing many types of mixed commercial and residential uses—why can't I open a hair salon, coffee shop, or dentistry or law office and live upstairs? We should be categorically allowing duplex conversions and accessory dwelling units, except in rare cases where there's some pressing reason not to. Small apartment buildings alongside single-family homes? Go for it. A strong town is built to change. A fragile town is built to look the same in 30 years as it did when constructed. The Suburban Experiment is fragile. Places like Scranton, for all its problems, have many of the built-in elements of a strong town. A lot of these aren't especially charming. They're not tourist destinations. I'm not talking about the swanky enclaves of boutiques and specialty shops you can stumble upon in wealthy neighborhoods of most American cities. These are true mom-and-pop establishments (literally, and often remaining in the same family across multiple generations). This is a working-class town, but it's one that has held the Walmarts of the world at bay to a surprising (to this native Midwesterner) extent. I've been offered cultural explanations for this: there's a close-knit sense of community in Scranton, many people have multi-generational roots there, it's a place where people value tradition, etc. I'm sure these explanations have their place. But I believe as a rule that people respond to incentives and to conditions in their environment. And thus, you should never look for a cultural explanation where a structural one will do. And the structural explanation here is simple: Scranton's traditional development pattern allows mom-and-pop businesses to survive. You can start up a restaurant or retail store in a small space on a very small budget here. Now think about what it'd cost you to open a franchise restaurant next to a highway. You need a parking lot likely bigger than the building itself. You need signage big enough to be visible to drivers at 50 to 70 miles per hour. You can't take advantage of the serendipity you get on a pedestrian-oriented street, where shoppers who came to visit the store next door stumble upon yours. Would I have known Scranton, Pennsylvania, one of the two core cities of the whitest metro area over 500,000 people in the entire U.S., had a "Laos Asian Market" if I hadn't wandered by it on foot while taking photos for this post? I've driven by this place a dozen, maybe two dozen times, and I never once spotted it from the car. 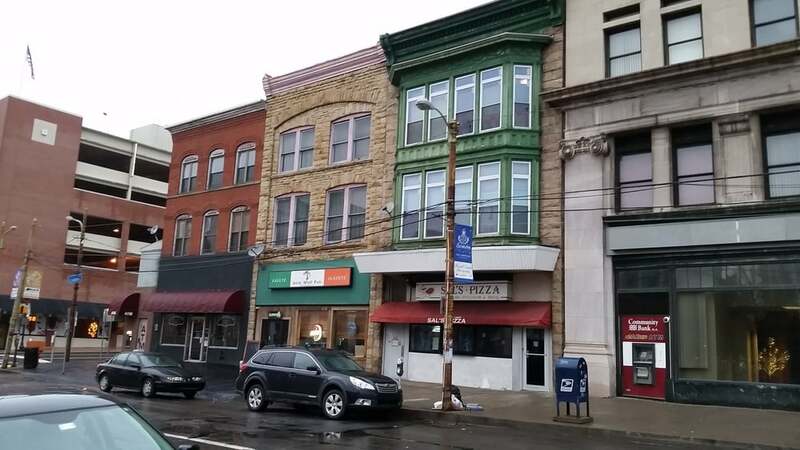 The traditional development pattern, combined with the extreme affordability of a place that's been down on its luck for decades, means that a city like Scranton is in many ways the perfect place for a small entrepreneur. The barriers to entry are as low as they come. Scranton isn't uniformly pretty—it has beautiful areas, ugly and decrepit areas, and often stark juxtapositions of the beautiful and the ugly side by side. This is what you have to expect from a place that is chaotic but smart, that is hanging on to a whole lot of charm and personality despite a history of hard times. I'm not writing this to fetishize Scranton's rust-belt grittiness in a hipster kind of way. Rather, I like the place because it has so much genuine potential. There's room in a place like this for its residents, with meager resources but a healthy dose of scrappiness and creativity, to invent the future. This is true in a way that is not true in America's vast expanses of sterile surbubia, built to never change. It's also not so true in America's charming but insanely unaffordable urban gems like San Francisco, Boston, or Charleston. Scranton is not a picturesque model of American urbanism at its absolute best. It has ugly buildings. It has areas that should be walkable but aren't in practice because sidewalks are absent or crumbling. I can find dozens of more aesthetically-pleasing examples of the benefits of granularity or pedestrian-oriented streetscapes. But they tend to be unaffordable, tourist towns, or both. Scranton is a wonderful example of good-enough urbanism - enough of the advantages of the traditional development pattern at a rock-bottom price point. I don't have to wonder how a place like Scranton will weather economic bust times. It's already demonstrated it. Things will be a bit ugly, like anywhere, there will be vacancies and deferred infrastructure improvements, but there will still be local businesses and walkable neighborhoods and community. The Rust Belt will rise again. The built-in advantages of a productive and versatile development pattern cause me to bet on a place like this. Places like Scranton are our past, but they also have a decent shot at being our future as the Suburban Experiment unwinds.